Barrel-aged cocktails are one of the most interesting developments in the nation's bar scene. I wrote about them this month for the trade publication Beverage Media Journal. Mostly, these are drinks you have to go out for, although there's no reason you couldn't make them yourself at home using the instructions for bartenders in the article. You'd just have a heck of a lot of drinking to do. You can sample the concept by trying High West's barrel-aged Manhattan, made from the company's own rye whiskey, Angostura bitters and sweet vermouth. 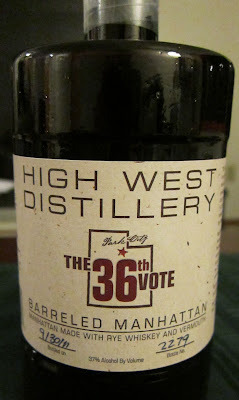 The idea of aging a cocktail is to meld the flavors, and it works very well in the "The 36th Vote." The most noticeable characteristic of this drink is the smooth mouthfeel. It's very lightly sweet on the palate, with the vermouth flavor at the fore. The rye, normally a fairly strong taste component, is detectable mainly after the finish, along with a hint of pepperiness. It starts sweet and finishes dry. People often drink Manhattans as an aperitif, and this would work well, but I have found I like it after dinner, perhaps because digestion makes me lazy. Sure, I could probably round up the ingredients and shake up a fresh Manhattan. Or I can just pour a little of this over ice. It's more complex than sipping whiskey, yet at 37% alcohol, it's almost as potent. At $57 suggested retail price ($45 at the store I found below), this bottle is not cheap. But consider what the cost of a call-brand Manhattan is, especially with rye from High West, Utah's finest distillery ("the 36th vote" refers to the vote Utah, of all states, cast to end Prohibition.) You'll get about 15 single cocktails from the bottle. In my dreams, an airline would carry this stuff. But then, in my dreams, I can fly. Especially after three of these. You can order a bottle here. Read the Beverage Media Journal article here. The concept of aging cocktails is really original. I love manhattan and probably will try one "aged" one when I will be in US.